Invite friends and have them bring hot glue guns...because you only own four. Attempt only one or two crafts at the most. We did a rosette and a flower pin. Provide food, drinks and plenty of supplies. I charged a few bucks for supply costs and everyone crafted ’til their hearts were content. Fun was had by all! It looks like fun! I had a few last year and they were great girlfriend times! 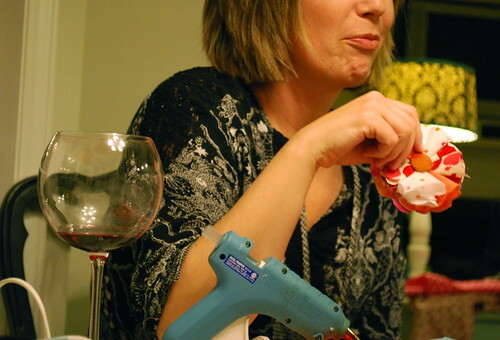 Friends and wine & crafting… that is a fun party! This sounds like so much fun! I need to find more crafty friends! I'm thinking I need to throw a craft party ASAP! Oh that looks like so much fun!!! Especially with the holidays coming up! OMG. Is that my chin? sooo much fun 🙂 thank you for having us and prank calling me!